The makers of the Hubble Hugo sent me a test unit. 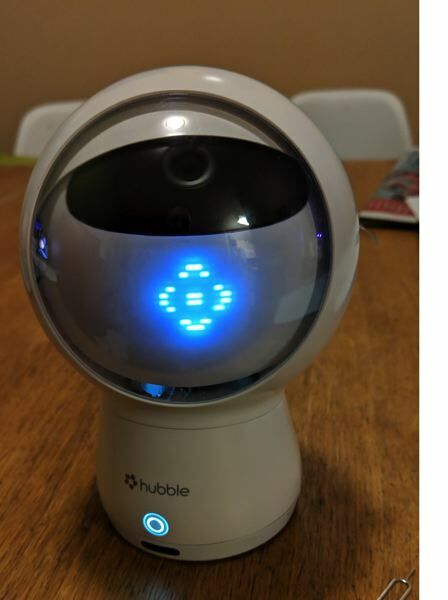 The Hugo is a large, blinking eye, designed as a baby monitor but good for wide-angle monitoring of any room. It comes in a rubber outfit, like a Despicable Me minion, which can be removed to get at the reset button. But the chief feature is the swiveling globe of its head and blinking plastic eyelid under the Perspex windshield. You can talk to it, it has 360-degree tracking and supposedly recognizes faces and voices. One of the blurbs on the box is "Alexa with an eye" and it is indeed Alexa-enabled. My daughter, who is 16, was appalled. She tapes over her laptop camera for fear of spies and does not trust the eavesdropping Alexa in our Amazon Echo speaker. She may have a point, but for now, it's moot. Hugo couldn't connect to our Wi-Fi. I tried manually entering the SSID and password and sending it both as a wireless signal and as a QR code, which the eye was supposed to see and digest. Nothing. The team in China who sent it even recorded a video showing me how. The lady's desk was cluttered with Hugos, but while hers worked, mine just couldn't be awakened. In the end, she put it down to a firmware error and promised to send an updated one. None of which I mind, because a lot of technology doesn't work right out of the box. I've had dead Fitbits, pre-bricked Chromebooks, and in 1998, a thing called a Ring Mouse which was supposed to usher in an era of manual gestures, but didn't. 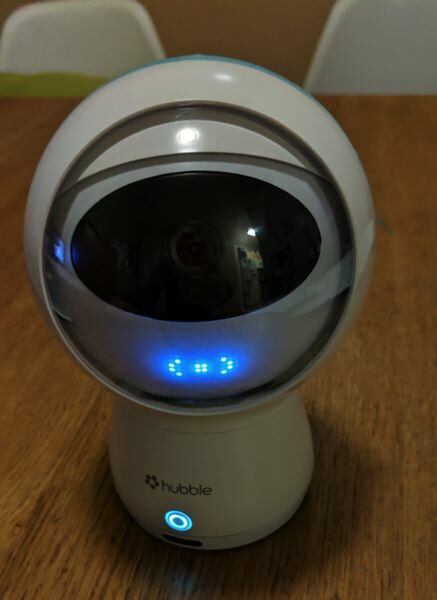 Which made me ask: Which is more off-putting, technology that doesn't work right out of the box, or connecting yourself to the huge, ever-growing pulsating brain that rules from the center of the ultraworld (AKA the Internet of Things) and being spied upon? Electric cars are a great idea, but try finding a charger when you're in transit. And then try finding an empty pump. And when you do, try finding something to do for three hours while you wait for that trickle to "fill" the tank. 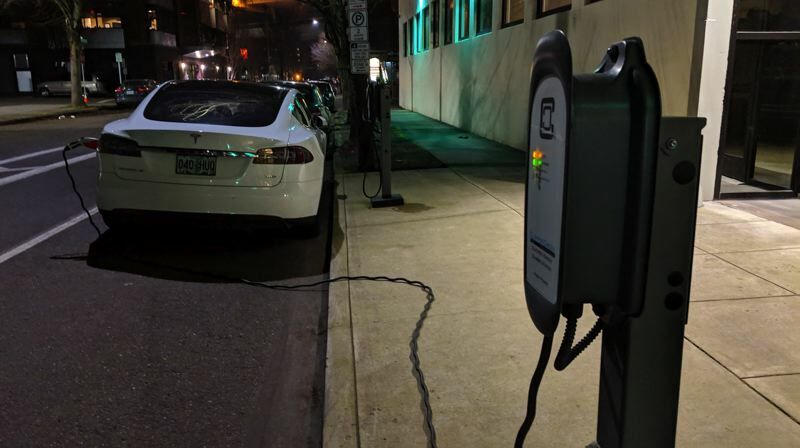 Trying to help, along comes Chargeway, a Beaverton company that aims to make charging EVs more user friendly. 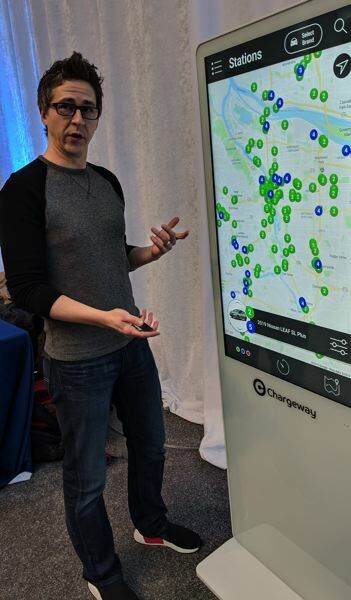 Matt Teske, Founder and CEO of Chargeway, presented his company's product at the Portland International Auto Show last week in front of friends and family of Forth, the EV evangelists. "It's a way of explaining electric fuel to the general public in an easy and more approachable way," Teske explained. 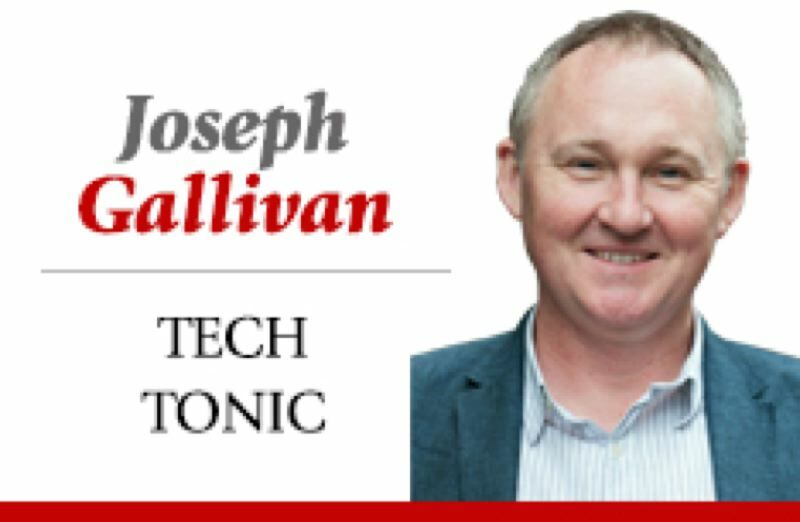 "With electric cars there are many models and ways to charge them, and a lot engineering behind that." He thinks the world needs an easier way to charge up your Volt, your Fusion, your I-PACE or your Tesla, without getting into all the volts, watts and amps stuff. Having walked around the show and seen where car makers put their charging points — front, side and back — you can see there is little standardization in this industry. Architects are tearing their hair out trying to design parking garages for these things, without knowing where the "tank" is. Teske said we need an easier way because people are "transitioning from going to get gas and remembering just one word, which is 'Regular.'" Chargeway has produced an app which runs over Google Maps. It uses colors and numbers to simplify charging potential. You choose your car's make and model and then colored circles pop up marking the charging stations. Green means it will charge at a standard speed, blue is faster, and the higher the number the faster the charge. "This creates a visual safety net for where you can charge." 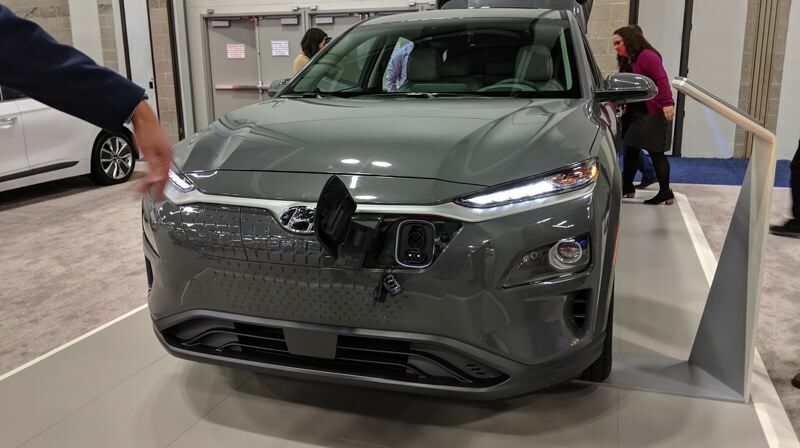 Chargeway also found people care about how long charging will take, and then how far they can drive once powered up. Getting stuck by the side of the road is one of all drivers' great fears. Consider this: If you shell out $70,000 for a 2019 Jaguar I-PACE, which has a 234-mile range, there are many ways to charge it. If you can find a Direct Current charger (in the street or at a mall) you can achieve a 0-80 percent charge in 85 minutes. If you have access to a 100 kW DC charger, that drops to 45 minutes. At home, it's best to get a Jaguar-approved home charger. The 7 kW single-phase AC on-board charger can fully recharge the vehicle overnight. If you hit rock bottom you can always plug into a domestic socket. As Jaguar puts it, "While charging directly via a domestic socket is slower than with a home charger, it should be sufficient to cover the average daily commute of 30 miles if the vehicle is charged overnight." That doesn't sound very Jag. To serve up the information where it counts — in the auto dealerships — Chargeway has developed a beacon or 42-inch touch screen. The sales person can explain how electric fuel works. The screens would be paid for by the public utilities, who aim to benefit from selling electrons (and would love to take over the charging infrastructure). Consumers can use the equivalent version on a free app on their phone. Chargeway's studies asked people how they use gas stations. Most people used two words: regular and premium. But they had no idea what octane was. They testified that they charged their phones but had no idea what a kilowatt is. Teske admires how Tesla built its charging network, but knows it can't be replicated. The pilot program began in Oregon last week working with PGE and Pacific Power. It is expanding with a grant from Business Oregon. The beacon also shows added incentives to going with an EV. It informs you if the Oregon clean vehicle rebate program is available, and what the real-world fuel savings would be. Teske showed how he might use the app to plan a trip to see his brother in Spokane. The software showed the one charging station he'd need between here and there, and how long he'd need to wait to fill up. 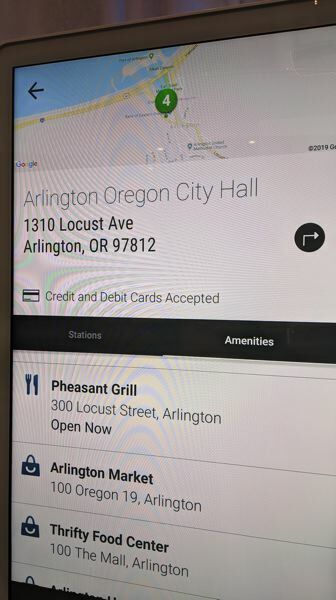 Like Google, it showed the nearby eateries and bathrooms. They are still waiting on some real time data: ideally if someone is already using a charger it would be greyed out on the map. All in all, he calls it "A way for anyone who has never used an electric car to choose a car and travel comfortably." That sounds like someone is trying to make life easier. When I get my replacement Hugo from China, I will ask him what he thinks.